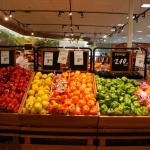 Very often, shoppers chose their supermarket based on the quality of its fresh fruits and vegetables, so vibrant and fresh colors must be the focus of produce merchandising. The color of regular lighting is skewed to enhance greens and yellows (to maximize lumens per watt). But other important colors, such reds and whites, appear faded – they are not as bright as they should be. The most appealing produce displays use Promolux balanced spectrum lamps because they show the true, vibrant colors of lettuce, tomatoes, bananas, oranges, eggplant, cauliflower and all other fresh fruits and vegetables. 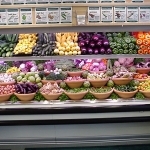 When it comes to fresh produce merchandising and protection there is simply no other lamp that can compare to Promolux. 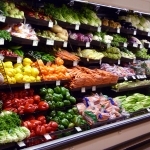 The most successful produce displays in terms of inventory turnover are those that are merchandised for the greatest color impact, highlighting the variety and selection of the fruit and vegetables. 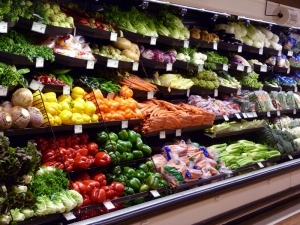 This is because shoppers tend to choose their supermarket based on the visual appeal and the quality of its fresh produce. 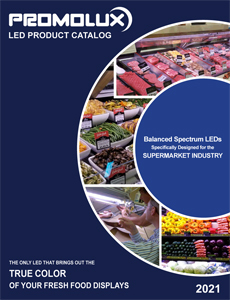 Therefore, fruit and vegetables in supermarket produce departments displayed under specialty lighting that reveals their vibrant and fresh colors, without damaging them or causing premature spoilage, must be the focus of produce merchandising. Many of the vegetables that we eat grow underground or in the dark, and are exposed to light for the first time when they are put on display in retail produce outlets. 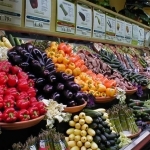 The UV and visible spectrum radiation from regular display lighting can increase the surface temperature of displayed merchandise and initiate or enhance chemical and organic processes that change the appearance, texture, and flavor of the vegetables. Radishes are bright red when they are first harvested, but they become faded when exposed to light. Inferior display lighting can cause other root vegetables such as carrots, beets, and parsnips to continue to grow. Bulbs such as onions, garlic, and shallots begin to sprout when exposed to light, and the outer layers turn green. Tender bean sprouts and other sprouting seeds continue to grow, becoming tough. These effects can be minimized by using Promolux’s low UV lighting with a balanced visible spectrum. Promolux LEDs are the only LEDs that bring out the true color of fresh food.